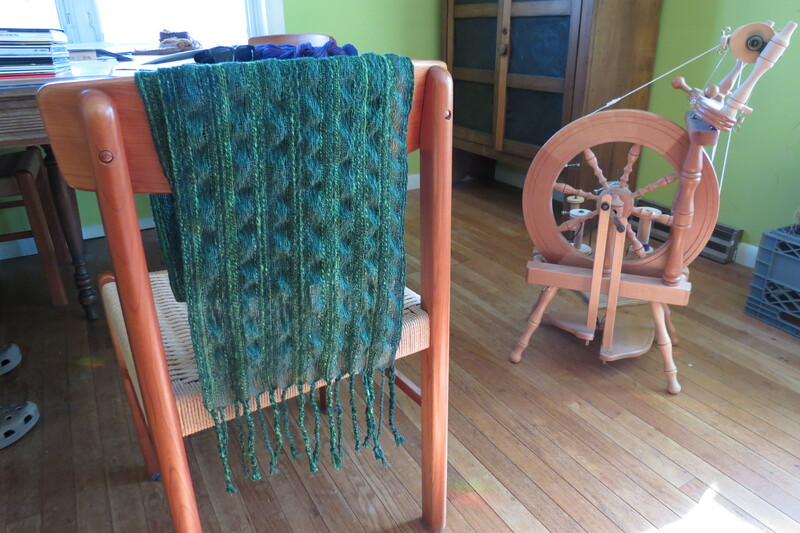 I’ve spun yarn for about 25 years and never found it particularly difficult. But I never tried to spin cotton until recently. Unlike other fibers, I found cotton very difficult to spin. 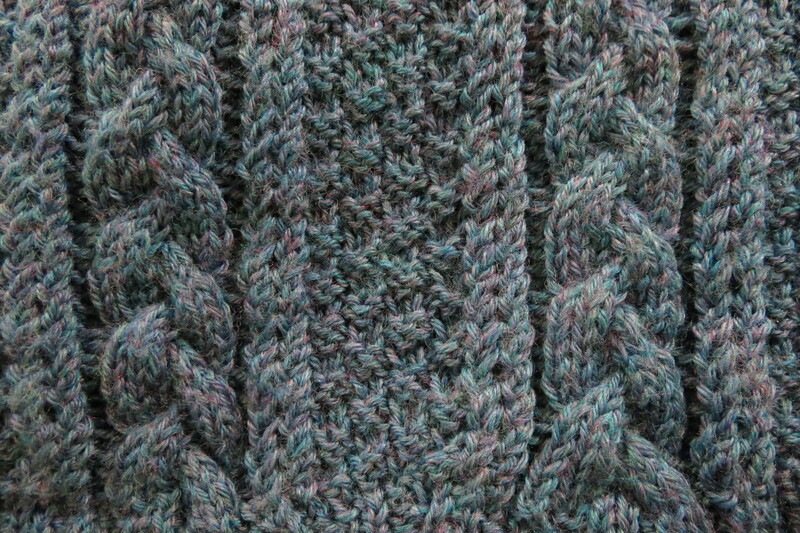 My first attempts at making yarn were unsightly and so weak that they were useless for weaving purposes. It was embarrassing because I had thought of myself as having better spinning skills. I didn’t want to accept the fact that I was not capable of a better product. So I set myself a challenge: to improve my spinning skill to make a fine cotton thread capable of being used for a warp. The photo below shows the skeins of organic cotton that I have spun over the past six or seven months, with the oldest on the left and the newest on the right. If you click and enlarge, it’s easy to see that the consistency has generally improved over time. The thick-and-thin bits have diminished in number, and the overall fineness of the thread has improved dramatically. 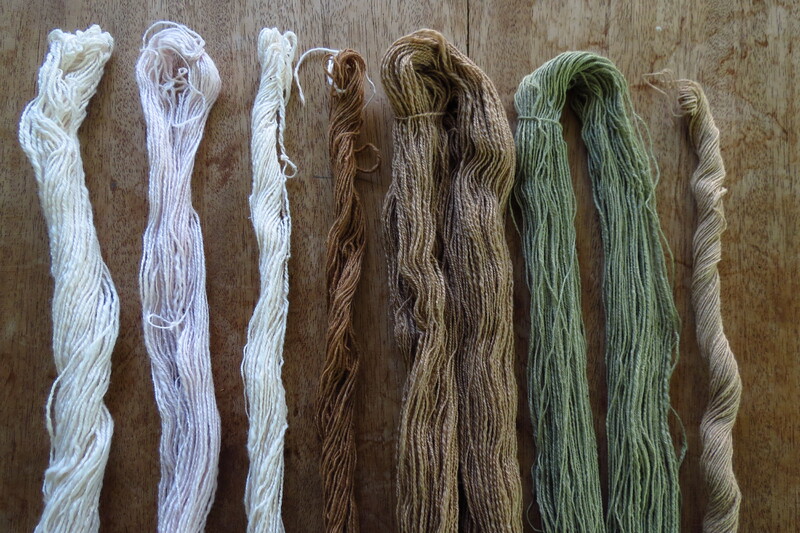 The most recent skein (on the far right above), the natural brown cotton, is the finest diameter thread of all, and it’s a triple-ply. 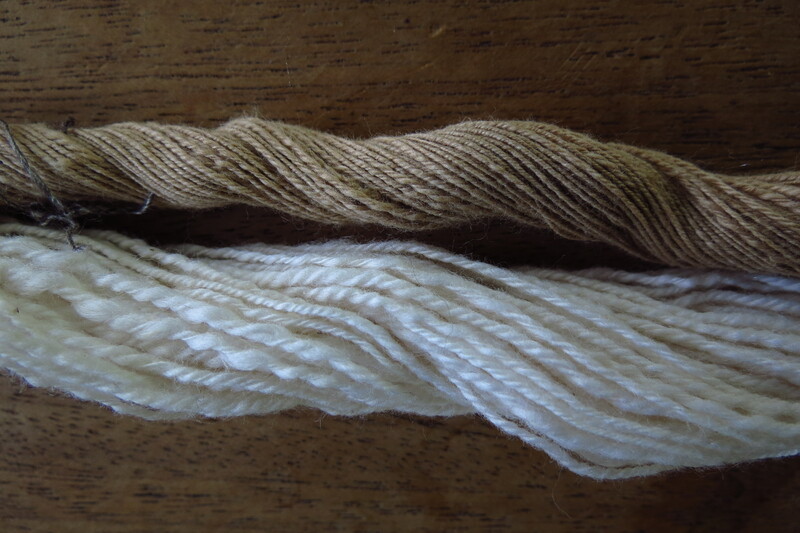 Compare it in the photo below against the much thicker double-ply that I spun as my first foray into cotton. The triple-ply is overtwisted, true, but since I’m interested in achieving contoured effects such as collapse weave and tracking, this will be ideal. 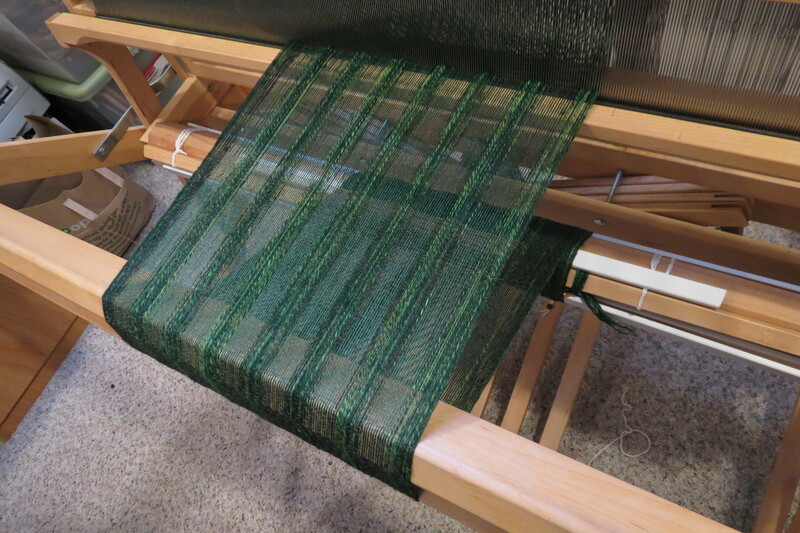 The double-ply is much softer to the hand, but it’s too easy broken, which means it’s useless as a weaving warp. 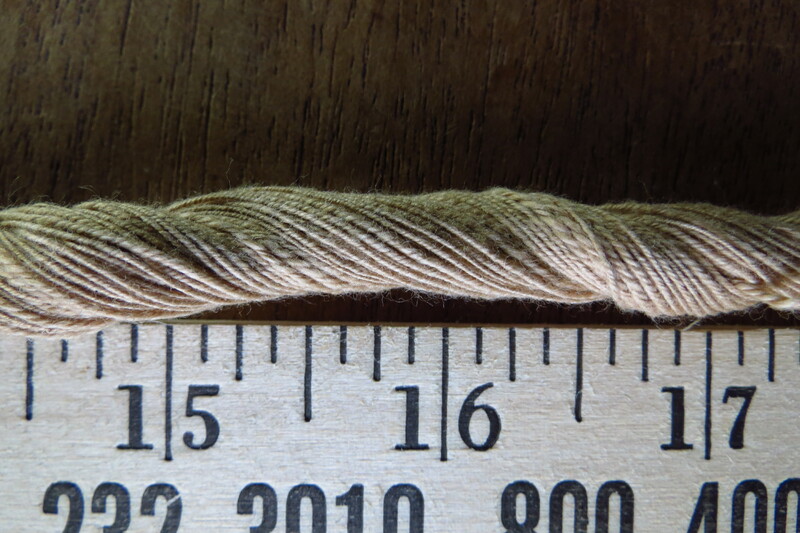 The triple-ply is approximately the same or slightly less in diameter than commercial 10/2 cotton weaving yarn. I believe I might be able to get 20 threads per inch using it. Has anyone out there had success in spinning cotton warp that is both fine in diameter AND sturdy? I would appreciate all tips. They’re all GORGEOUS! How much yardage? Thank you, Jenny! 🙂 The larger skeins in the first photo contain at least 100 yards each; the most recent small skein of triple-ply has 57 yards. And there’s more where those came from, because I bought more than a pound of colored cotton fiber last month. The fun never ends! Thanks for writing.